I just got back from Taiwan, where I’m “famous,” according to one of my extremely kind hosts. Not famous like David Hasselhoff, German rockstar, or Jerry Lewis, French phenom, but “famous” to about 15 telecom law professors and media activists. Even that was surprising, and worth diving into. Being kind of a big deal in Taiwan would have its benefits. Before my trip, Tim Wu told me Taiwan was the greatest place on earth. After all, Taiwan is a beautiful island in the tropics–an island of mountains, beaches, temples, and skyscrapers. The tea and food is amazing; they love to eat and eat well. The people are almost uncomfortably generous and kind. On this trip, I was even assigned a brilliant undergraduate-student, fluent in English, as my body person, making sure at all times that I was well-fed with dumplings, sated with sufficient green tea, and never lost, never late. As for my supposed fame… One of my hosts told me that the Taiwanese Supreme Court recently cited one of my law review articles in an opinion on underground radio licensing. Several of my hosts–professors of communications or law–had read my articles. One professor asked permission to translate an article into Chinese. My supposed fame rested more on my advocacy, however, than my scholarship. The media reformers of Taiwan, notably Campaign for Media Reform and Media Watch, are students of global media reform movements and well-versed in the American experience–including with the organization Free Press, for whom I once lawyered on media ownership limits and network neutrality. As a result, I was speaking as a keynote at an impressive conference bringing together (actually) famous mainland Chinese blogger dissidents (including Michael Anti), media theorists, and reform activists. But, while reading more about Taiwan on my 13-hour flight back to San Francisco, I realized I wasn’t famous even to 15 people; instead the Taiwanese just practice a beautiful cultural kindness. They are apparently overly generous and super polite to everyone. My treatment was standard. All the tours of Tainan, Chiayi, and Taipei. The student body-person acting as my nanny. The kind words. The books explained that the Taiwanese are so polite that they tell you “Your Chinese is excellent” precisely when you screw up a phrase in Chinese. At least you’re trying. They tell you “You’re so good with chopsticks” precisely when you drop the sticks and start using your fingers. At least you tried. This explains why my undergraduate nanny, who lent me her video game device, the Nintendo DS, told me “You’re so smart” when I screwed up on stage-ten of Tetris. She went to stage-12 or so. It also explains my experience in Taipei, when I ran into a woman wearing a Michigan shirt. In Taiwan, a lot of designer shirts have random English words on them. This woman’s Michigan shirt–which was glittery and sequined, pink and purple not maize and blue–seemed random that way. But I’m from Michigan, and, thousands of miles away, I see a Michigan shirt. So I asked, “Do you have a Michigan connection?” She didn’t understand and kept walking. So, in Taiwan, I’m not only famous, but I am also unnervingly handsome. Tim Wu was right: best place on earth. So I have to thank my wonderful hosts and new friends. They’re too many to name, but they include professors Shih-Hung Lo and Ching-Yi Liu, as well as my little nanny, Joyce, who hopes to study in the US. They made my trip to Taiwan special in many ways, and I learned a lot, both about media policies and the island. Thanks. 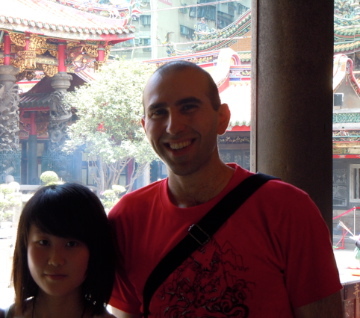 And here is a picture of me and my nanny at the Longshan Temple.